Introducing Anou’s Artisan Leader Mentors! 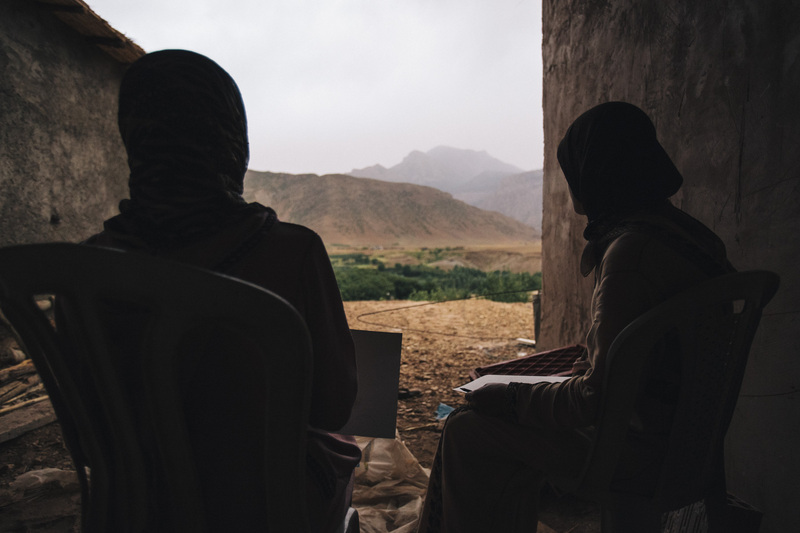 The key to the long-term success of the Anou community depends on whether the artisans and artisan leaders can develop the vision for their own community’s future. As we’ve written before, the more artisans are in control of managing Anou, the more experience they’ll gain in overcoming obstacles. This struggle creates the foundation for artisan leaders to evolve the community as their market changes in the years to come. While all this makes sense on paper, it gets a bit blurry on a practical level. Many of the challenges artisans will face developing the Anou community are likely to be completely new and very complex. For example, how will artisan leaders continue to maintain and build a collaborative culture amongst themselves and their community? How do they better understand and respond to their customer’s needs and concerns? How can they deal with rapidly increasing sales volumes and improve the community’s logistics? The answers to all of these will come to the artisans leaders with time. But they shouldn’t have to go at all their future obstacles alone. In fact, there are many successful leaders in Morocco that have already overcome many of the challenges the artisans will soon face. So why not put these leaders in touch with artisan leaders to help mentor them as they continue to build Anou’s community? Starting late September, this is exactly what we are going to do. Over the past two years, I have been fortunate to meet amazing entrepreneurs in Morocco, many of whom have since become my go-to people when I am need of advice or support. Two of them I believe can be an equal resource to artisan leaders and have excitingly volunteered to become mentors for two artisan leaders. T he first mentor is Fatim-Zahra Biaz. 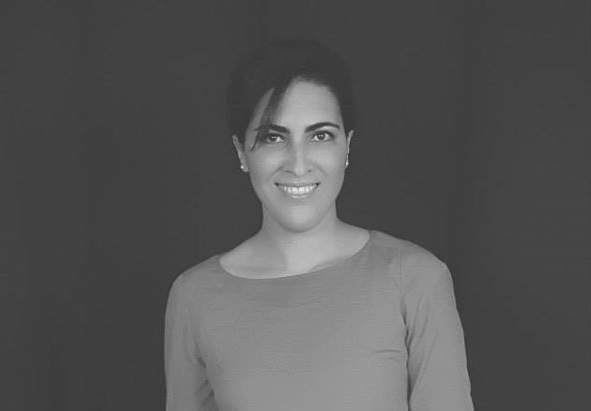 Fatim-Zahra was a management consultant in Paris and worked for a wide range of multinationals and focused on areas related to customer experience. Today, she is the founder of the New Work Lab in Casablanca, the most successful co-working space in Morocco. Fatim-Zahra has agreed to meet with Rabha Akkaoui once a month to discuss and share their respective challenges and successes within their businesses. The second mentor is Kamal Reggard. 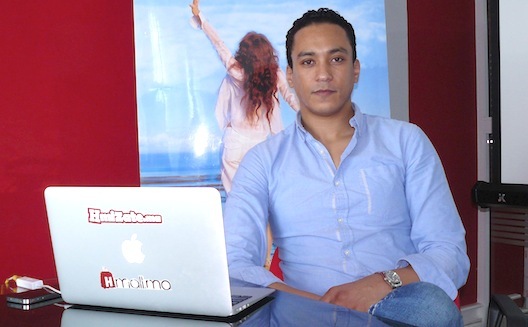 Kamal is widely regarded as the most successful tech entrepreneur in Morocco. After studying and working in the US, Kamal returned to Morocco and soon after launched Hmizate.ma (a daily deals site) and then eventually Hmall.ma, the first e-commerce market place in Morocco. 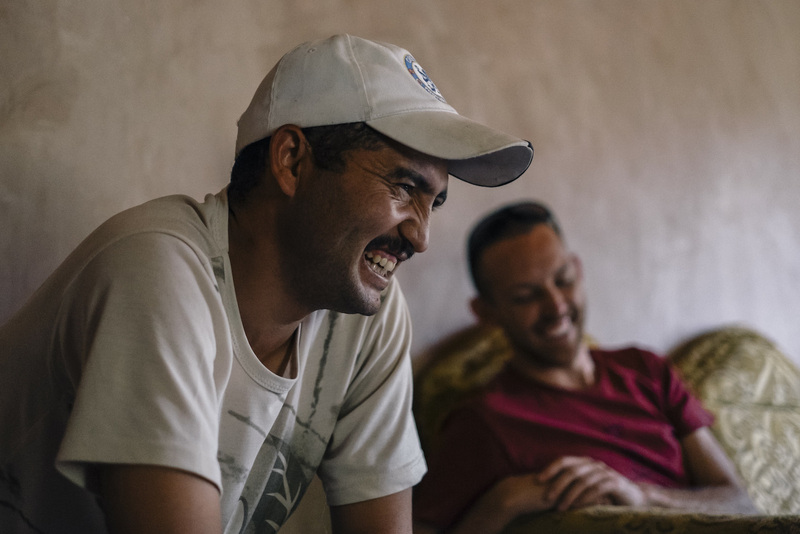 Artisan leader Brahim El Mansouri will meet up with Kamal once a month to discuss their respective challenges and successes. Brahim will also be interning for the day at Hmall.ma, helping out where ever needed to learn how the most successful e-commerce marketplace in Morocco operates. 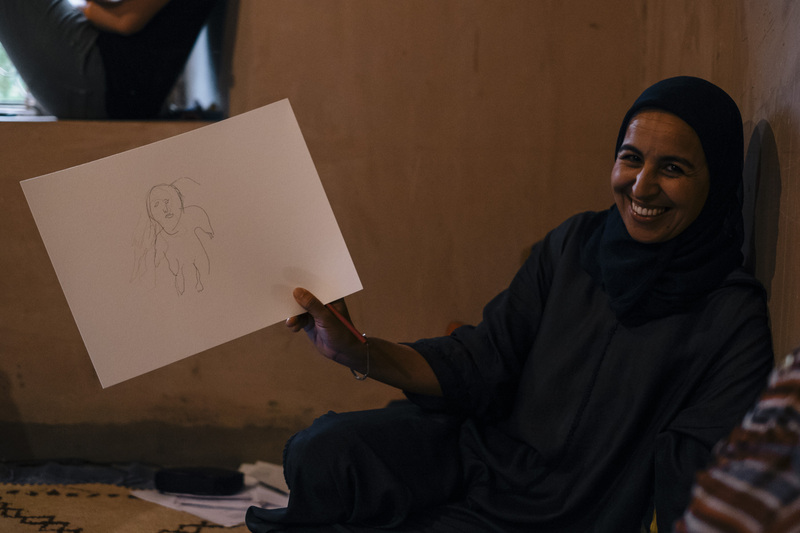 We’re excited to have the immensely talented duo of Fatim-Zahra and Kamal working alongside Anou’s artisan leaders as mentors. By sharing their experience and wisdom, they will ensure that Anou’s artisan leaders can address the most challenging problems that will come their way in the coming years. 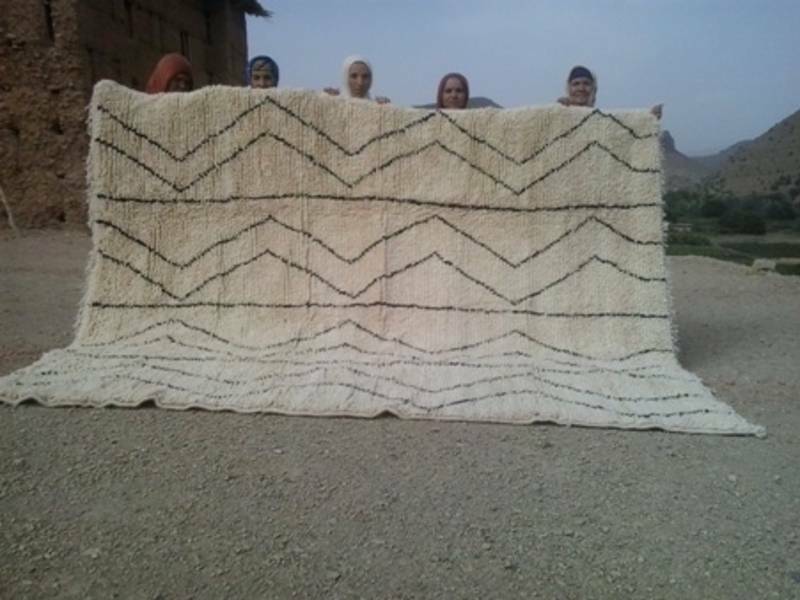 A huge thanks to Kamal and Fatim-Zahra for their support of Morocco’s artisan community! Summary: Starting on October 1st, Mustapha Chaouai of Association Nahda (http://www.theanou.com/store/9) will become the Anou community’s second director. 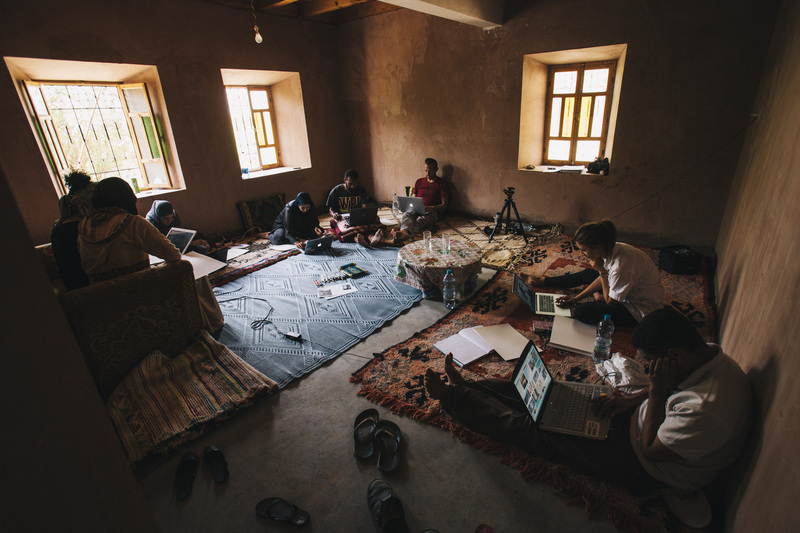 This is one of the most important steps in ensuring that the Anou community is always led and managed by Moroccan artisans. The post below discusses Anou’s current and future community structure in detail and why it is so important. In the months after Anou’s artisan leaders took responsibility for managing the operations of the online store, there was a mix of excitement and worry. We were excited because, well, the site didn’t implode. We had our fair-share of issues (e.g. failing to follow up orders, wrong orders shipped, poor communication between artisans, leaders and even myself, among others), but it was clear the artisan leaders could manage the Anou community as it was. Realizing our long-term vision of making Anou fully artisan run was tangible for the first time. But we quickly sensed something was off. A lot changed as we moved from 2013 and into 2014, namely that the community nearly doubled in size. The issues we were experiencing after the handover in control turned out not to be just growing pains, they were red flags that the Anou community wasn’t structured in a way which could handle any more growth. If we grew any larger, the problems we experienced wouldn’t melt away, they would be exacerbated. 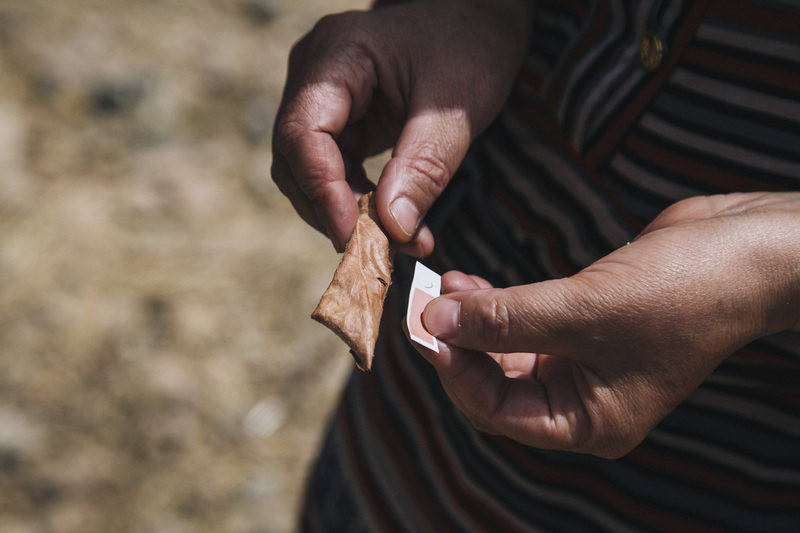 During a meeting with senior members of the Ministry of Handicraft, they said to us that it was great that Anou was fully artisan run but were skeptical of Anou’s impact since it only reached a couple of hundred artisans. They asked us whether Anou could truly remain artisan managed while having an impact on 1.3 million Moroccan artisans. We understood their skepticism. 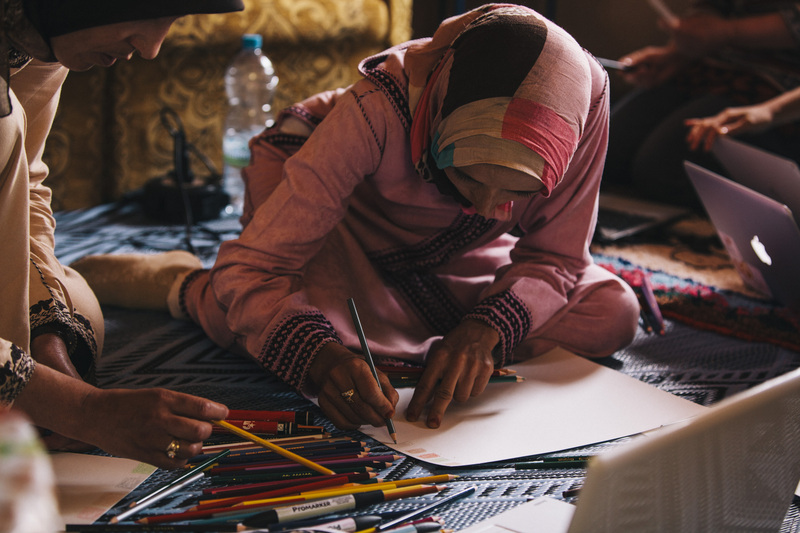 Ultimately, we don’t want to scale for scaling’s sake, but we cannot create equal access to markets for Moroccan artisans if Anou remains as a small niche community. The easy answer to this is to simply bring in outside help, whether it be more fair-trade middlemen or volunteers, to scale Anou. But anything that isn’t truly artisan led is not sustainable. The solution to this can only be found within the artisan community itself. Brahim El Mansouri, the Anou community’s first artisan director. Since the beginning of 2014, our structure has been pretty straight forward. 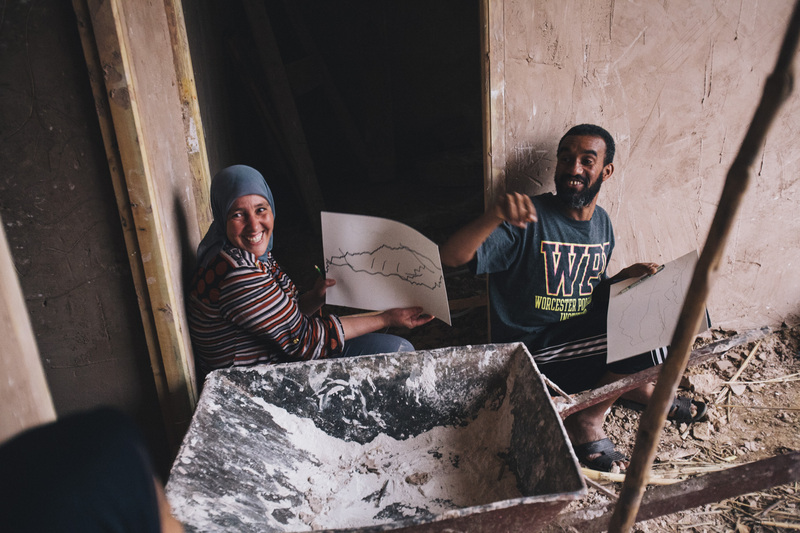 Brahim El Mansouri, a woodcarver, served as the director of the Anou community and was the point person for almost every action of Anou. Payments, trainings, outreach, were for the most part managed by Brahim. In addition to him, there were trainers Rabha Akkaoui, Mustapha Chaouai, and Kenza Oulaghda who handled trainings and follow up visits. 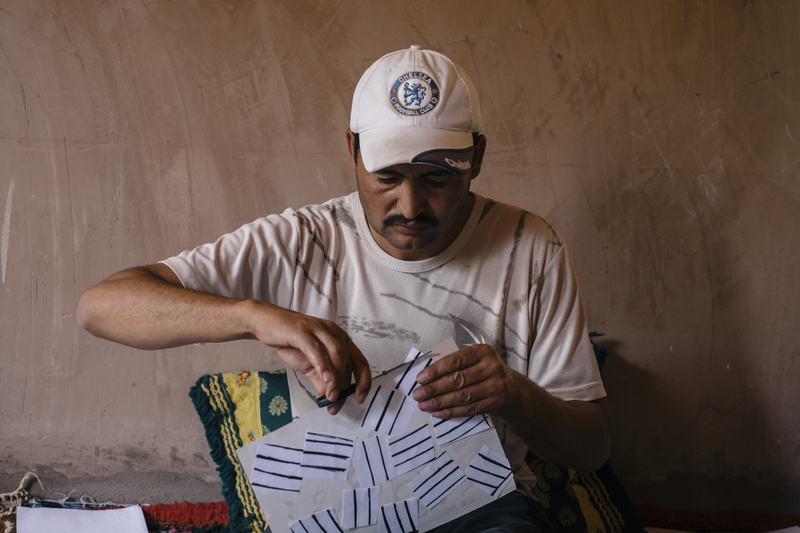 If a new artisan requested to be trained, or an artisan needed some additional in-person help, Brahim would send out one of the trainers or go himself. Lastly, there was myself. I managed quite a large number of roles, but if I had to pick a title, it would be most akin to a community supporter. I principally oversaw how Brahim and the trainers were doing and would step in to advise when something was amiss. I also dealt with the community’s customers and would simply relay comments, requests and complaints of customers back to Brahim, who would then be responsible for addressing them. I was prohibited from calling artisans myself and had to work through Brahim, who would then address any issues that came up himself or delegate it out to the trainers. This was important because it provided Brahim the crucial experience grappling with and solving the common problems the community faced. But this is where the cracks emerged. Brahim could really only handle so much in addition to his work as an artisan and apple farmer. My job turned into constantly reminding Brahim of all the things he had to do, and then occasionally jumping in and take over certain problems because they’d might not ever get addressed. The issues weren’t major, but they clearly demonstrated that if changes weren’t made, the artisans weren’t going to be able to scale the community any larger. We needed to rethink how Anou’s community was organized. To create a structure where Anou’s community could scale while remaining artisan led, we needed to find a way to enable existing and future trainers to step up and help manage Anou. The current trainers, Rabha, Mustapha and Kenza, were ideal candidates simply because they have clearly demonstrated their commitment to growing the Anou community. However, at our size there isn’t enough work or funds for four director positions, and at this point, it is too difficult to ask a trainer to work part-time because a) they would never get the opportunity to understand all the operations of the site, and b) it would just be another person for Brahim to manage. Instead, what became clear is that we needed to find a way to get the trainers to have the same experience Brahim has had this year managing Anou. We discovered that the ideal situation would entail a trainer becoming the director for a set period of time; something along the lines of a director-in-training. If all the trainers had the same experience managing the operations of the site, the trainers would be that much better in supporting the director because they will have a fuller understanding of director’s needs. No longer would the director have to micromanage each trainer. This would go a long way in resolving the recurring issues at our current size. Most importantly, as Anou grows, there would always be a fully qualified pool of artisans ready to step up and take on the management tasks whenever more full-time work becomes required. The challenge then was getting Brahim to temporarily step down from his position to let the other trainers rotate through his position. When I first proposed this at the end of 2013, he said he would rather quit than relinquish his role. His frustration was understandable, if it wasn’t for him, Anou wouldn’t exist. Moreover, he worked incredibly hard the first year of Anou and much of that time was spent trying to get the now trainers to even consider trying Anou’s online store. The reality of the suggestion, I explained to him, is that it is not a demotion or promotion of any sort, it is simply a part of a longer strategy that will enable the Anou community to always be fully artisan run. If we didn’t do this, Anou’s future as an artisan run community would be in jeopardy. With time, Brahim understood the importance of the decision and warmed up to it. 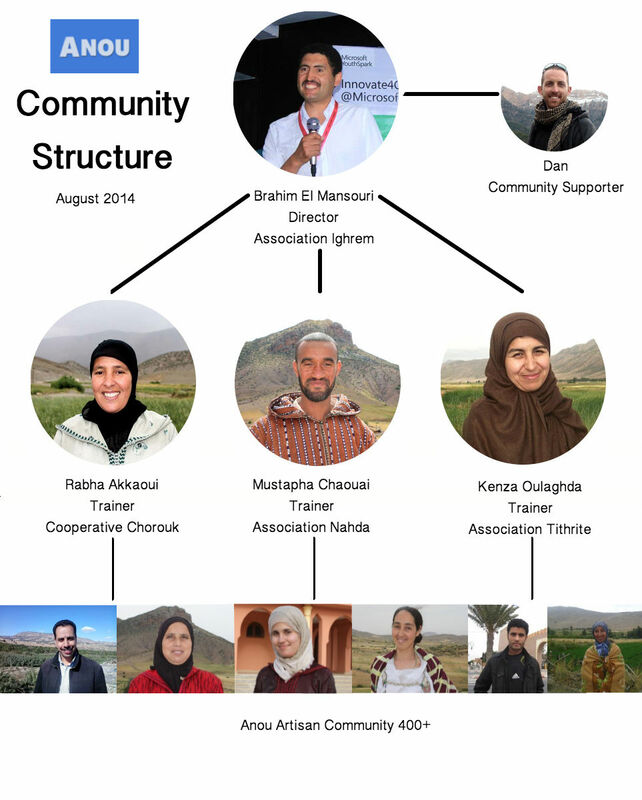 With Brahim’s consent, Anou’s community structure was set to take shape. At our last Anou leadership meeting that took place last in the beginning of August, Brahim and the leaders agreed that on October 1st, Mustapha Chaouai will become Anou’s artisan director for a period of approximately two months, or until Mustapha is fully comfortable in the role. Brahim will work with Mustapha to learn the ropes and adjust to the pace of working with the community supporter (what has been myself until now). Brahim will then assume the work as a trainer alongside Rabha and Kenza. 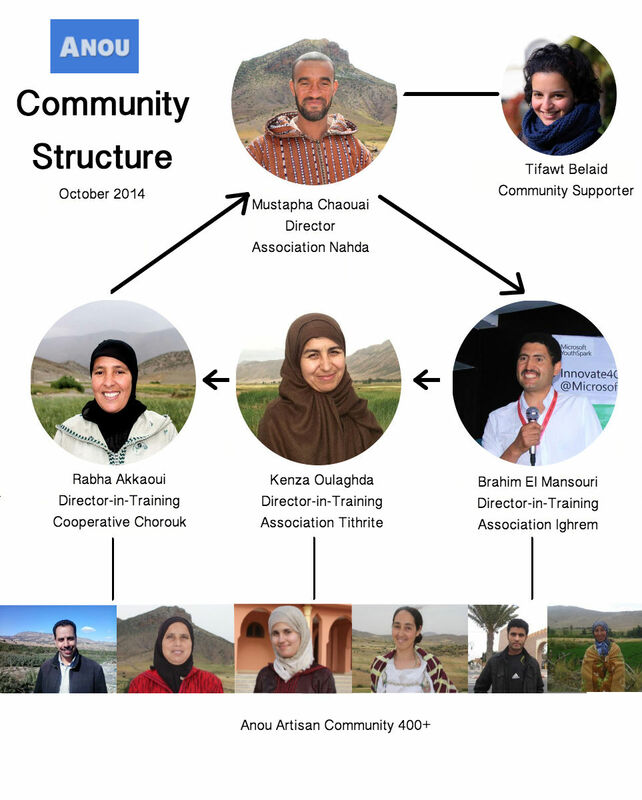 When Mustapha has fully adjusted, he will then step down, and Rabha or Kenza will step up to assume the responsibilities as Anou’s director. The strategy to cycle trainers into the the director position is one of the most challenging decisions we have had to make since beginning Anou. You don’t have to look much further than the nine months it took for us to develop the structure and agree on it. Yet the struggle will be worth it as the new structure will prove to be the most defining decision of the Anou community. 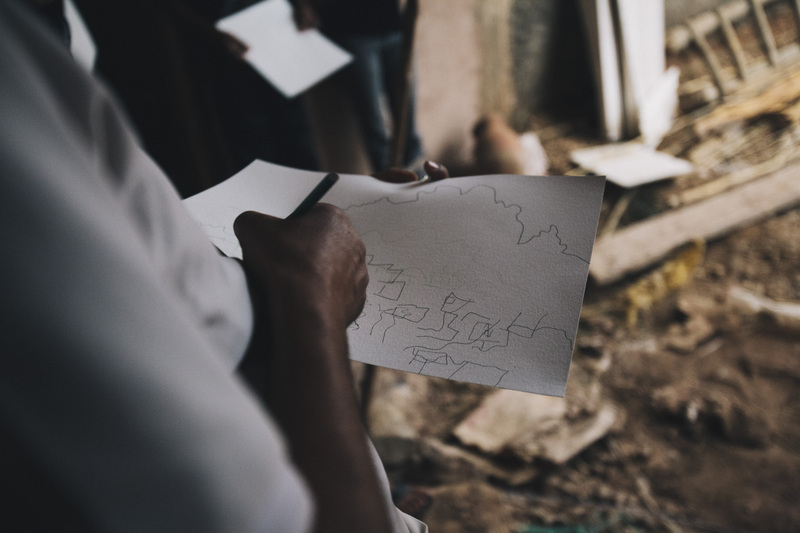 Since we launched Anou, we’ve been driven by the belief that solutions to complex problems that afflict vulnerable communities can only be developed from within. While everyone can unanimously agree that artisan communities around the world are at risk of disappearing, there seems little consensus on how to revive them. Sadly, artisans are rarely a part of this discussion. Artisans, many say, are too poor, too uneducated, or simply that they just aren’t capable of taking part in defining their own future. On the surface, those people may be right. 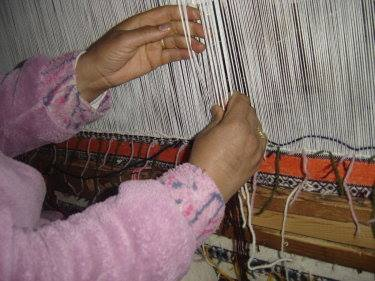 One does not need to look any further than the fact that every effort to support Moroccan artisans is always initiated and managed by foreigners. But this the root of the problem. If artisans aren’t given the opportunity to step up and take control in addressing their needs, then nothing will change. They’ll remain poor, voiceless and reliant on the good intentions of outside organizations. Anou’s community structure changes all of this. 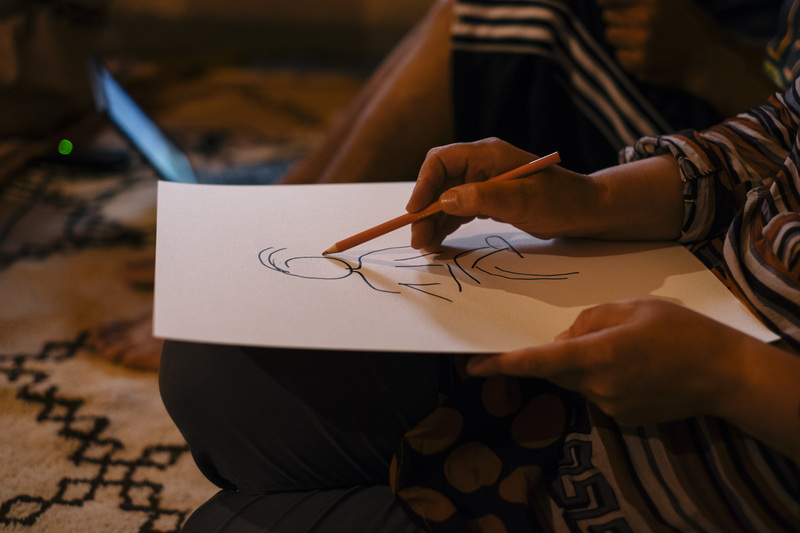 Now, all Moroccan artisans who are willing to work hard and are committed to the growth of the artisan community in Morocco now have the chance to gain the experience and skills necessary to meaningfully contribute to Anou’s vision. Eventually, the Moroccan artisan community will have a voice and presence strong enough to independently shape their community. This is what we mean when we say Anou is community led and managed. We couldn’t be more excited for this phase of the Anou community to begin. 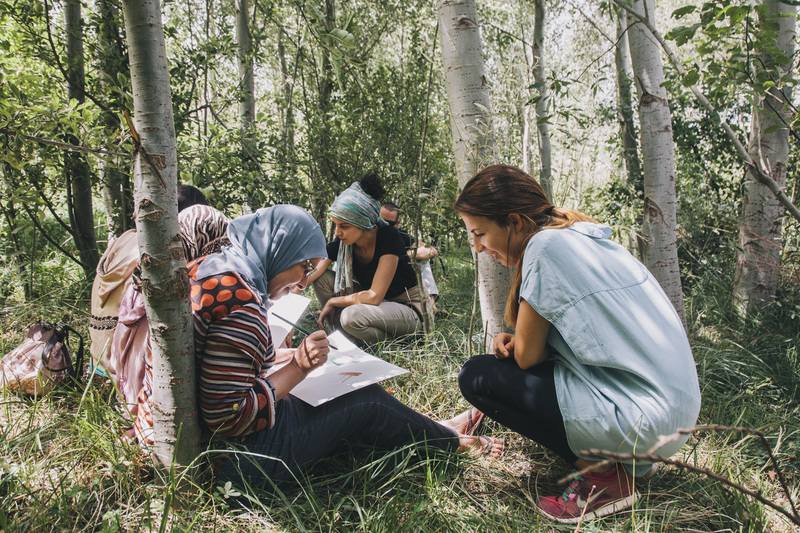 On August 6th, designer Sabrina Kraus Lopez (www.sabrinakrauslopez.com) and photographer Simon Mills (http://photosby.si) arrived in the Ait Bouguemez Valley and launched the first part of the British Council/Anou’s Common Thread project. 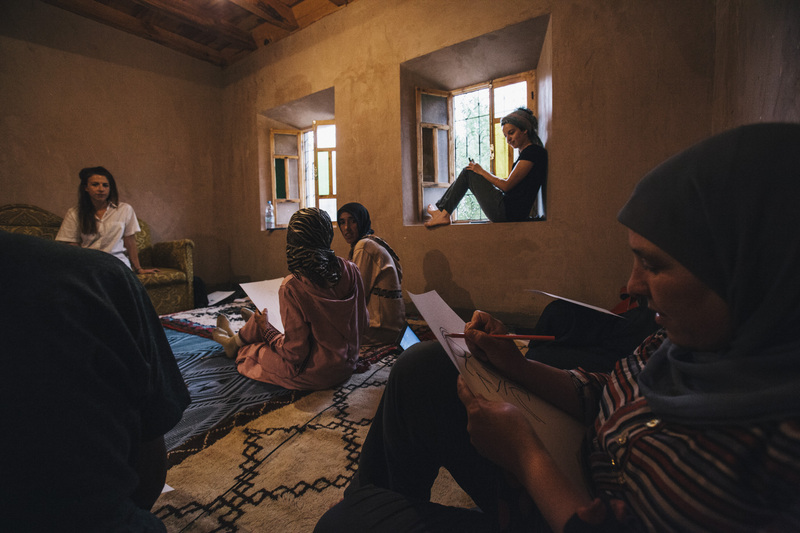 The launch capped several weeks of preparation by Sabrina to create a workshop that would benefit Anou’s artisan leaders, and by extension, the wider artisan community in Morocco. 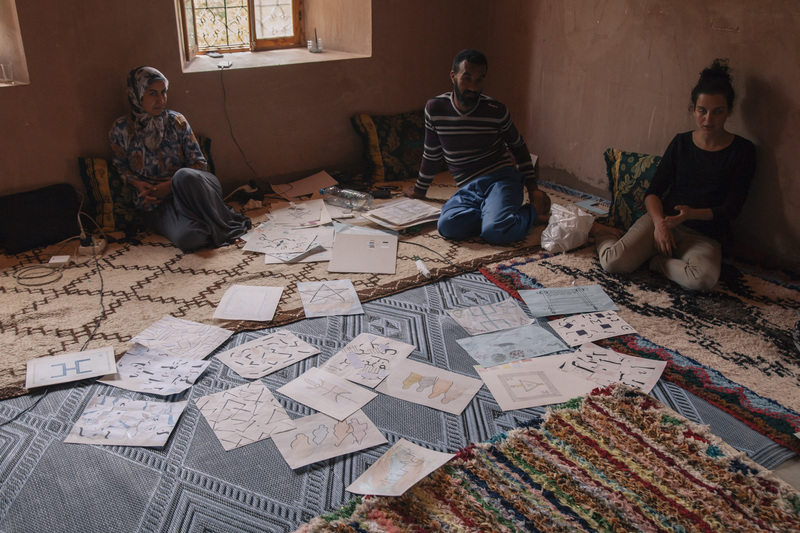 Design workshops for artisans are inherently difficult to pull off and almost always have mixed results. Generally, such workshops focus on showing artisans a current trend and then dictate what kind of designs artisans should make. While such workshops had their place when artisans had no access to global markets, this is no longer the case. Unchanged, these workshops may help artisans in the short-term but ultimately ensure that artisans remain dependent on the ideas of others to develop their craft in the long-term. Unfortunately, many workshops forget that artisans are designers, too. In this context, Sabrina’s took an entirely different approach to designing a workshop for Anou’s artisan leaders. 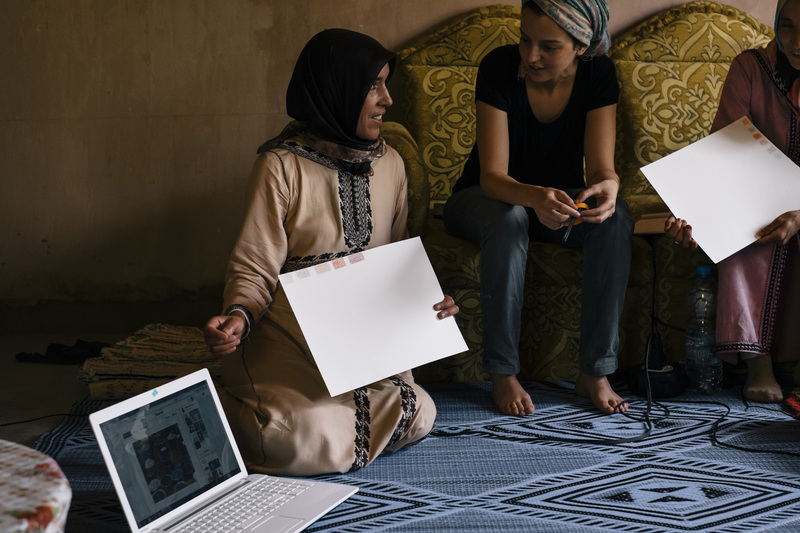 Instead of dictating design, Sabrina developed a truly impressive curriculum that integrated Anou’s online tools the artisan leaders were familiar with and taught them new design techniques aimed at enabling artisans to create new designs that were inspired by the artisan’s own imagination, story and community. The overall goal was simple: get all the artisans to look at everything in their environment just a little bit different than they normally do. The end result was impressive. Take a look below at the pictures Simon (http://photosby.si) took of Sabrina’s design workshop. We’ll release the artisan leaders’ final designs later in the month! Sabrina started off the workshop with an introduction to color theory and asked all the artisan leaders to use Pinterest to identify images they liked and use the colors from within the images to create color boards. The artisans then selected five of their favorite colors from their favorite photo found on Pinterest and used them to create their color board. Here, Fatima of the Imelghaus Cooperative creates her color board. After selecting the images and their colors, each artisan explains their selection to everyone else. Here, Fatima Ouakhoum of the Cooperative of Imelghaus explains her choices. After the artisans created their initial color board, they went outside in search of physical objects to complement their color board. 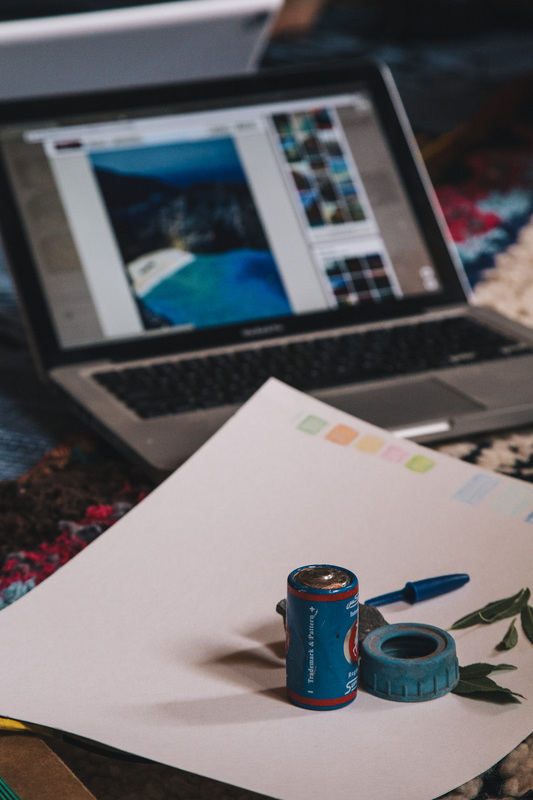 Kenza Oulaghada of Association Tithrite used a picture of a tropical beach as the source of her color board and then matched it with a pen cap, used battery, and leaves. 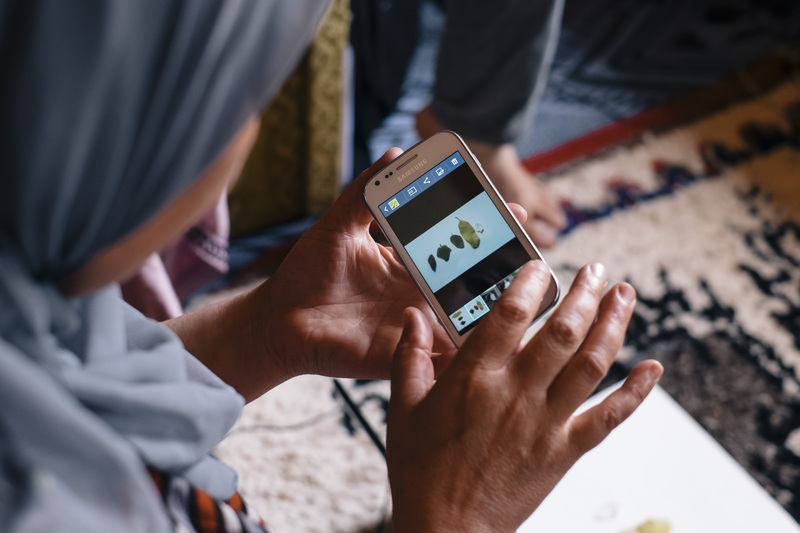 A huge benefit of this activity was that it helped artisans match colors from their screen to their actual environment — a challenge many artisans face while using Anou’s online tools. 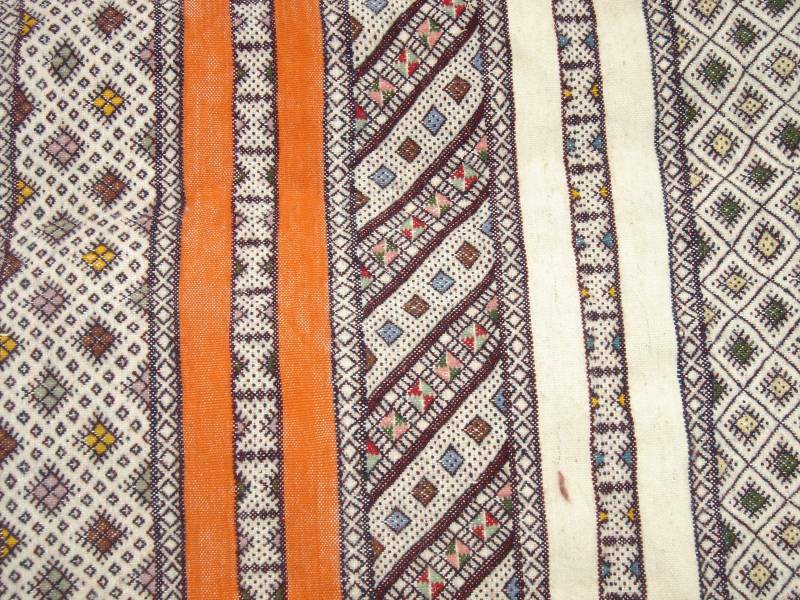 When all the artisans completed their color boards, they used the colors to create a new design idea. Kenza of Association Tithrite puts her new color board to use immediately! And of course, artisans then snapped photos of their color boards and posted them on the Anou community’s Instagram account. Rabha Akkaoui’s (pictured) color board got a lot of attention on Instagram! Later, artisans then helped create a color board for all the designs that will be used for the Common Thread exhibition at the London Design Festival. After collecting all the colors, Sabrina and the artisans put the final touches on the color board that will be used for all the designs that the artisans will bring to the London Design Festival. Later on, Sabrina taught the artisans in new design techniques that involved tracing the outline of objects and environments while not looking at the canvas. Here, Sabrina poses so artisans can trace her using this new technique. …other times, not so much! Yet all attempts lead to new and creative ideas. Sabrina also encouraged the artisans to use this new technique on landscapes as well. Little by little, Brahim El Mansouri’s (Association Ighrem) landscape comes into focus. Everyone gets a good laugh when their drawing doesn’t come out nearly as close as they think it will! Mustapha (right) of Association Nahda, makes fun of all the other artisans on their landscape pictures! Another design technique artisans explored was to draw out a name, traditional design, or what ever else they could think of and then cut the drawing up and glue it back together all mixed up. 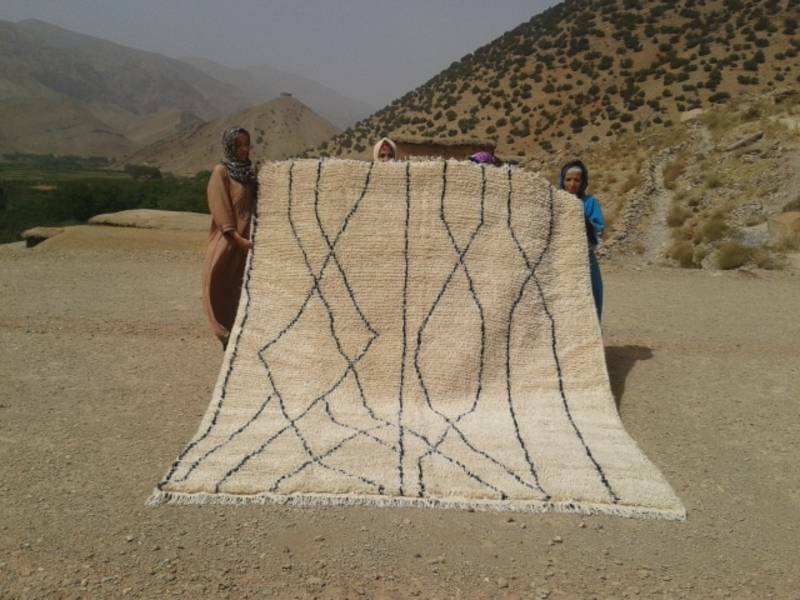 Here, Brahim tries this technique with a Beni Ourain style rug found commonly in his village. 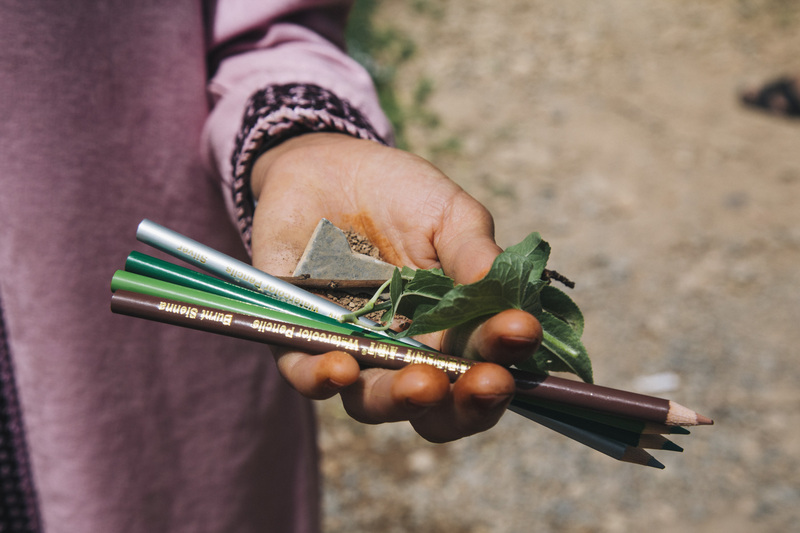 For the last technique, Sabrina and the artisans walked out into the fields to try out water colors. Artisans painted their ideas on paper and then pressed the water colors on top of the designs they traced the day before. On the last day, the artisans had to come up with twenty new design ideas each. Then, they had to pick their three favorites and Sabrina picked the final six designs that will be used for London. We’ll reveal the final designs later this month! 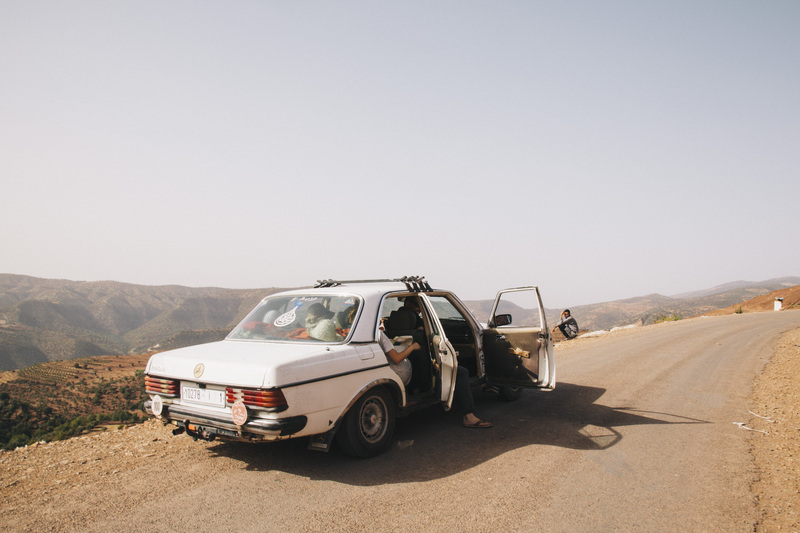 Designer Sabrina Kraus Lopez and photographer Simon Mills arrive in Morocco and take a taxi to Ait Bouguemez to begin the British Council – Anou’s Common Thread project. This past week we officially launched the Common Thread pilot project in collaboration with the British Council’s Architecture, Design, Fashion Department. Many changes have been made to the project since we initially announced it and we couldn’t be more excited. The most obvious change is the project’s new name. The project’s vision is to create a truly equal learning exchange between Anou’s artisan leaders and British designers. We believe that this new title perfectly encapsulates this vision. In addition to this change, the British Council completed an intensive search for a designer to take part and selected Sabrina Kraus Lopez (http://www.sabrinakrauslopez.com), a graduate of the MA Material Futures at London’s University of the Arts: Central Saint Martin’s. Part One The first part of the Common Thread project will bring Sabrina, Scottish photographer/designer Simon Mills (http://photosby.si), and all Anou’s artisan leaders out to Ait Bougamez for a one week design workshop. The workshop will equip artisans with new design tools that will enable artisans to create designs inspired by their personal stories, community and craft. At the end of the workshop, the artisan leaders will each design a rug using the tools they learned and the ideas they developed during the week. In addition to this, Simon will also lead a photography training session and document the workshop via photography and video. Update: Success! See pictures of the training on our blog or on Facebook! Part Two After the workshop concludes, the artisan leaders will return to their villages and to weave the rug they designed. Sabrina will then accompany artisan leader Rabha Akkaoui (www.theanou.com.com/store/5) back to Tounfite and will live and work with the cooperative for two weeks. 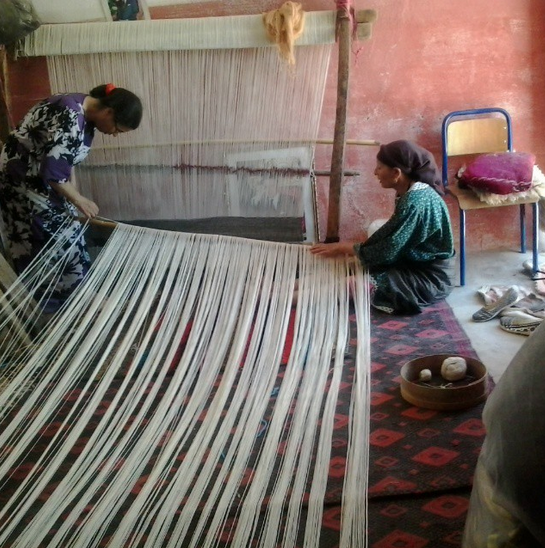 Sabrina will design and weave her own rug using traditional weaving techniques learned from the members of Cooperative Chorouk. 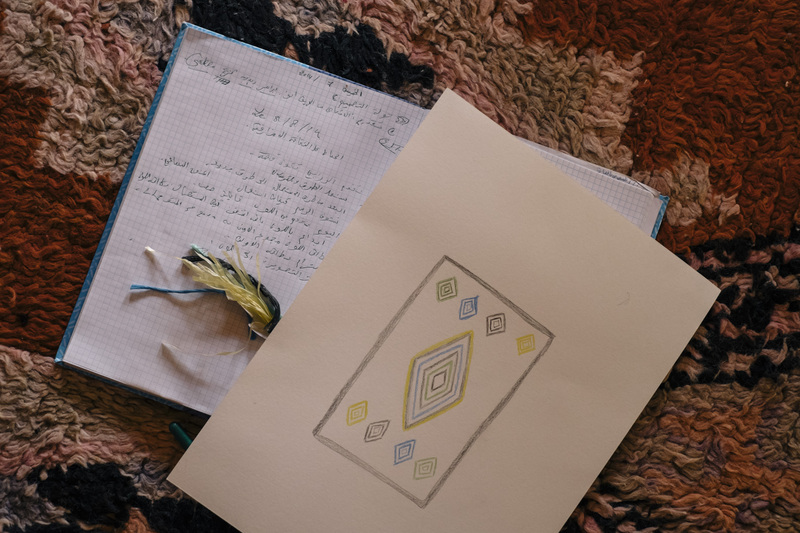 At the end of the two weeks, Sabrina will then travel to each artisan leader’s village to check the final progress of the rugs they designed during the opening workshop.Update: Success! read more about Sabrina’s experience in Tounfite on our blog or Facebook page! 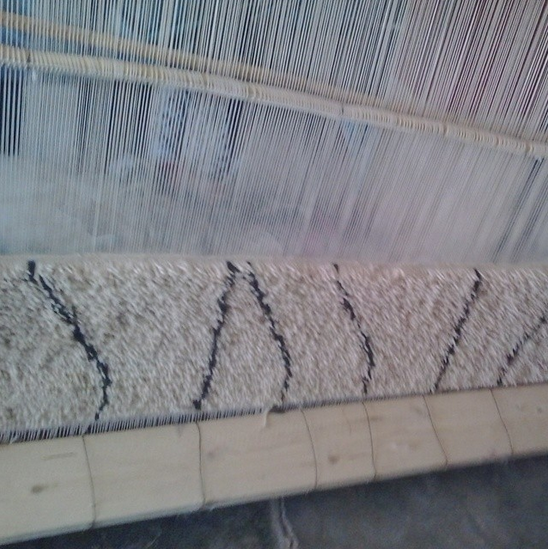 Part Three All the rugs that Anou’s artisan leaders and Sabrina complete will then be shipped to London. 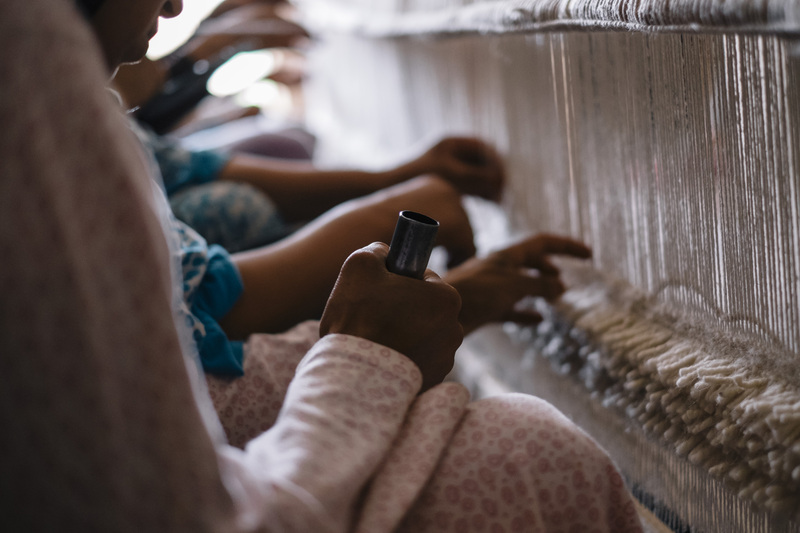 From there, an exhibition for the Common Thread project will be set up at the London Design Festival this September to display the rugs the artisans created. All the Anou leaders will be flown out to London for the exhibition and will speak about their experiences during the project and the larger vision of Anou’s community. In addition, the leaders will be given personal tours of leading design studios in London and meet leading British designers and design professors. 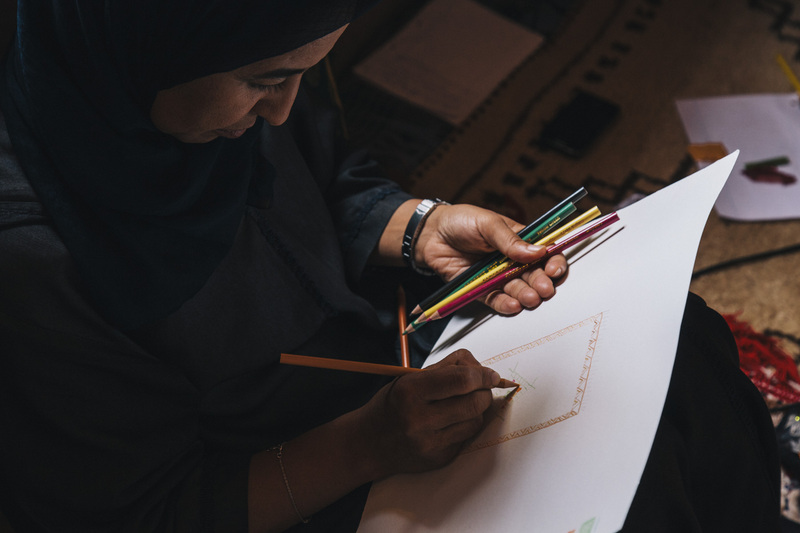 With such a huge focus on an equal exchange of ideas between leading Moroccan artisans and leading British designers, we simply couldn’t be more excited for this project. Projects like this are incredibly rare and we have to thank the British Council’s British Council’s Architecture, Design, Fashion Department for making this happen. Follow Anou’s blog, Facebook page, and Instagram account for updates as the project unfolds!